Divo. A small city in the Centre-Western region of the Ivory Coast, the cradle of the roots of the Djiboi people. This is where Manou Gallo was born on August 31st, 1972. Raised by her grand-mother who was looking after her like her own daughter, Manou was rather autonomous from early on: ‘At this time, I was leaving like a little savage. I was helping cultivating the fields, drawing water from the well. I wasn’t going to school, but my grandmother taught me traditions, respect, and values’. It is easy to imagine Manou, wearing tiny shorts as they were all clothes she had, her big smiling eyes, her head full of lice, climbing mango trees and running freely in the alley-ways of Divo. While waiting for her friends after school, Manou was already beating rhythms, banging on her legs, stomping with her feet, marking the tempo with her voice: Rhythm was her obsession: “When I was a little girl, I was already going from backyard to backyard, these places where each family comes together everyday to cook, sing, in one word to live together. I was meeting my girlfriends and sooner or later we inevitably started singing, dancing and beating on iron boxes”. In the Ivory Coast, playing music is an ongoing tradition taking place at funerals, births, or to welcome newly born twins as well as for any event of everyday life: In Divo, life follows the traditional Djiboi rhythms. From a material point of view, life is just basic, but it is full of warmth and people live there feeling good in their heads. It is precisely during a funeral for which the appointed drum player never showed that Manou first impressed an audience: Always dragging a stool behind her, she went towards these big drums, the talking drums (‘Atombra’ in Dida, the language of the Djiboi people). She climbed up to the height of the braced skin and started beating on them. Her mastery was already amazing. In the heart of Bada, the village which represents the most ancient part of Divo and where traditions have remained most alive, people were just amazed: ‘Everybody was really astonished, and a bit shocked also since women are not allowed to touch these drums. In some extent, they were taking me for a witch. My grandmother was supporting me and on this occasion, she explained to me that this was a gift, transmitted to me trough a dream her own mother had and who died the day I was born. When at the age of 8, I was getting seated to play drums during this ceremony, I could feel the power of my ancestors on my fingertips’. Years went by and Manou grew up. Still living in Divo, she sold oranges and developed her ability to master the rhythm on a daily basis: ‘My whole life was already written in Divo: It seemed that there was no need for me to go off the tracks. However,…’. Each summer in the Ivory Coast, meetings are organised during which participants from all over the country get together. The objective is to create a sort of an artistic competition amongst the young: This event is called Vacances-Culture (Cultural Holidays). In 1984, at the age of 12, Manou took part in her first show. It was also the first time she left Divo. This theatrical performance, which is now organised for other children coming from all around, is inspired by Manou’s story. It describes the life of a little witch who receives the power to play drums. The play is always a big success. Very soon, Woya became famous in the whole Western African region. 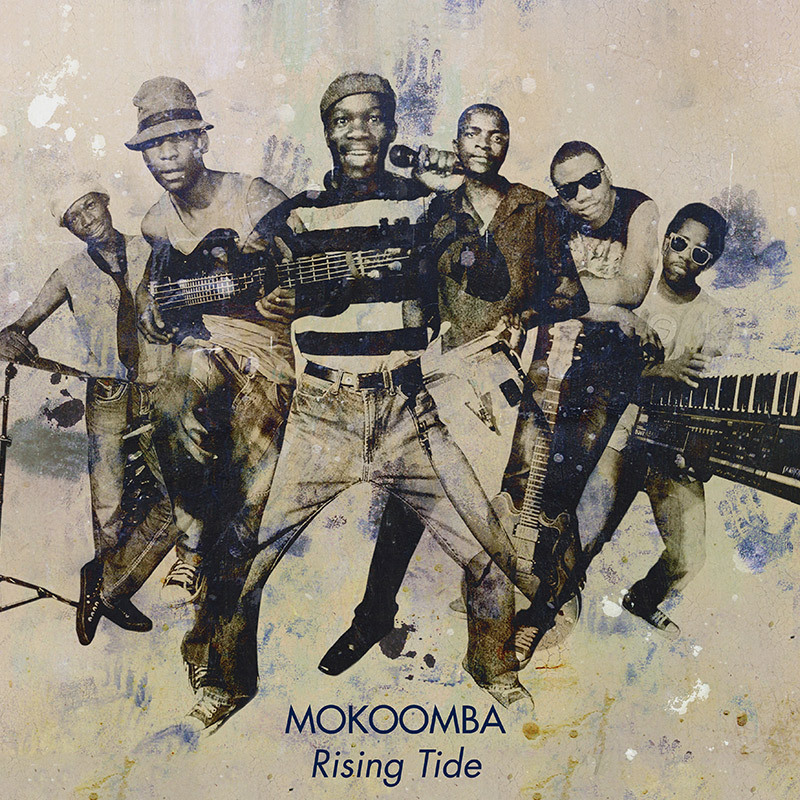 From 1985 to 1989, the band toured intensively in Burkina Faso, Mali, Togo and Bénin and recorded four CD’s. In the meantime, Manou was acquiring experience. When the band Woya dissolved, Manou followed Marcelin Yacé in Abidjan. He took her under his wing, and gave her her very first bass and taught her how to record sounds in his studio for three years: ‘I was only thinking about music. I only had one objective: To become a full-fledged musician and I was investing all my energy in this’. From 1993 to 1996, Marcelin sent her to hone her artistic skills in the pan-African village of Ki-Yi-Mbock, where she joined a theatre troupe, learned dancing and took part in the recording of a new CD produced by Ray Lema. In 1992, during the MASA event in Abdijan, an international market presenting art creations from all over Africa, Manou met Michel De Bock, tour manager and lighting engineer for Zap Mama. They met again several times in the Ki-Yi village and got along very well. 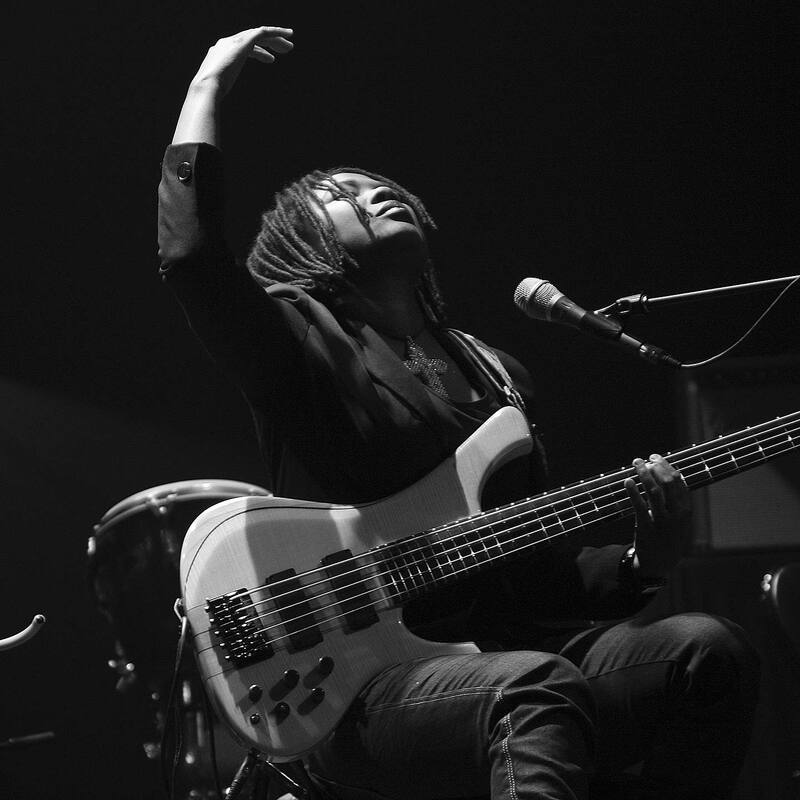 Manou and Michel got along so well, that when Michel heard that Marie Daulne, leader of Zap Mama was looking for a bassist for her band, he immediately thought of the young girl from Ivory Coast and had her come to Belgium. 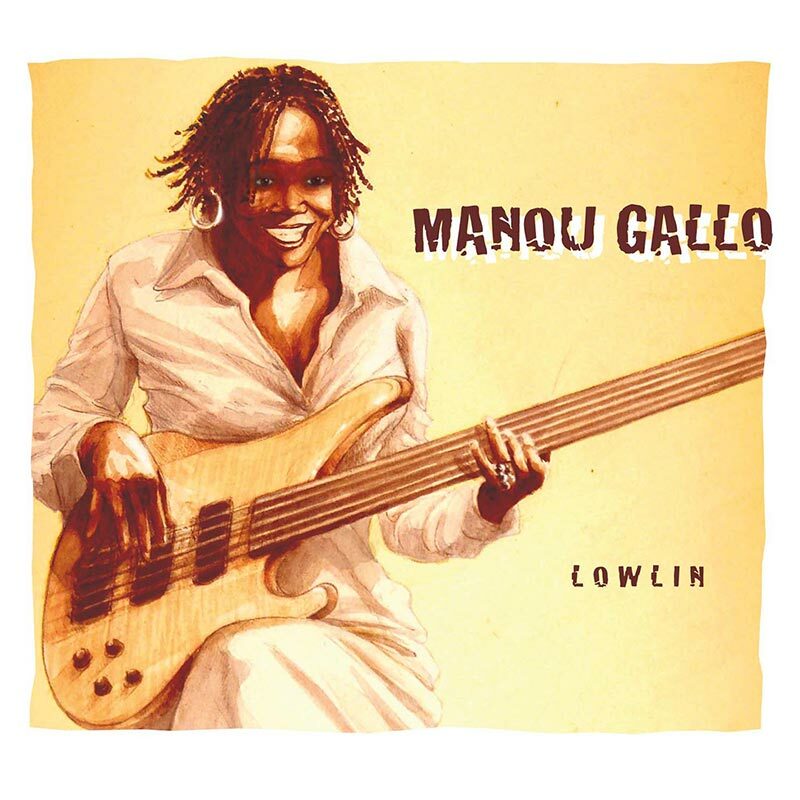 Manou Gallo landed on January 3rd, 1997, at 8 am in Zaventem airport with her bass and djembé. Well, she hadn’t yet won the game since Marie Daulne had just returned from Indonesia and had views on another musician: ‘My arrival in Brussels was a real shock. A temperature shock as it was snowing. I was dead cold at the rehearsals, sticking to my bass and as close to the heater as I could, but I knew it was a unique opportunity that wouldn’t happen twice! I already knew the music of the band, I had to give the best of myself and this is exactly what I did during the trials, which finally lasted three days.’. Three days during which Manou played bass, drums and djembé. She sang and danced to warm up and after these three days she won the bet: Marie and the other members of the band welcomed her in Zap Mama. That year, with her first paycheck, Manou offered herself a belated New Year’s present: a brand new bass guitar! It has been six years since Manou is on all the tours, travelling the world over to play Zap Mama’s music. In 1999, she joined, the Tambours de Brazza for a few concerts where she is the only woman: ‘Here in Europe, I have learned to know the openness of mind, the mix of cultures and music’. Based in Brussels, Manou appreciates the diversity of this mixed city, but deep inside of her, she keeps a little melody in her head, straight from Divo: ‘When I go back to my country, I rediscover the colours of the sounds and the rhythms which have roared in my ears during my childhood’. This has certainly encouraged her to write her own lyrics, mixing French, English and Dida languages to say things as they come, to rebel or to keep Marcelin Yace’s beacon alive. Her lyrics follow the music she grew up with, but she added to it the influences she has acquired: ‘The music I wanted to create is a mix of all the steps of my life: my story and my background have inspired me’. To shape her music, Manou goes over one more step in 2001: She starts her own band with musicians who are also friends. This is a bit like when, as a little girl, she was getting all her girlfriends together and distributing roles during improvised concerts in the backyards of her childhood city, and today, along with her band ‘The Djiboi’, Manou intends to spread the music of Divo on radio waves and stages worldwide. guests such as Marie Daulne, Sabine Kabongo, Lene Christensen and DJ Grazzhopa, “DIDA” received unanimous international critical acclaim. The years 2003 and 2004 saw her projected onto the international scene with Manou Gallo & Le Djiboi, giving notable showcases in some major music events such as : the WOMEX in Seville (Spain) in October 2003, the MIDEM in Cannes (France) at the “Voices of the World” evening, in January 2004, sharing the stage with guests like Mariza, Ilenes Barnes and Stacey Kent, and the MERCAT DE MUSICA in Vic (Spain) in September 2004. 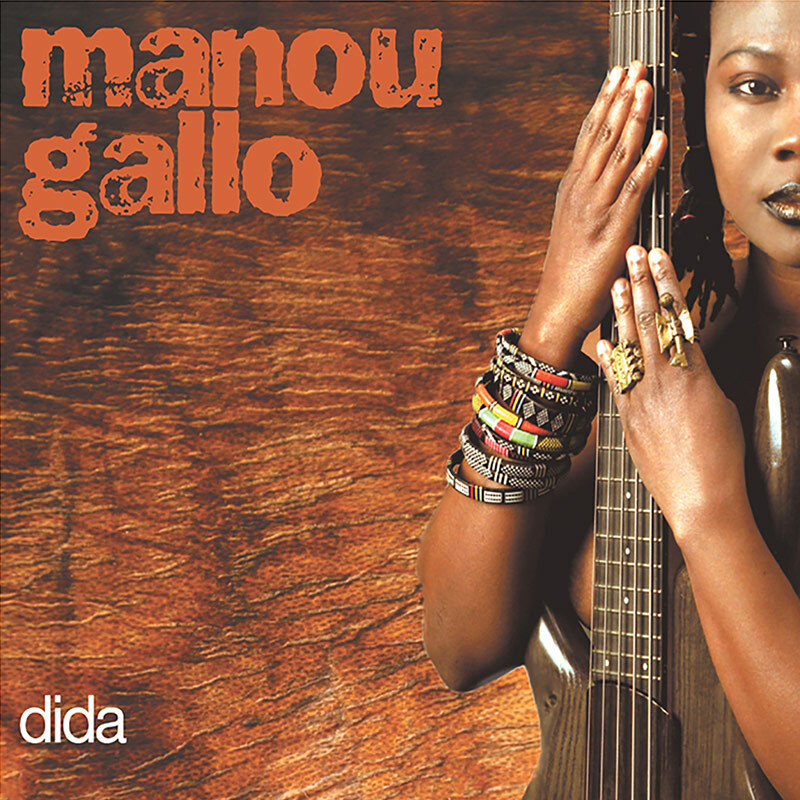 End 2004, Manou prepared a second “live” project which compliments the “Djiboi” project, called the “MANOU GALLO EXPERIENCE”. It’s an explosive trio where she gives free rein to her latest inspirations of a modern African woman of the diaspora. Contemporary and cosmopolitan, her inspiration comes from her travels around the world and her life in Europe but is still rooted in her origins, the people of “Djiboi” from Ivory Coast. Her unusual research is inspired by African polyrythmics which she fuses with blues, funk, groove and rock. Manou sings about Africa, Ivory Coast, its towns, its women, their pains and joys. The year 2005 was her first tour of the United States with a concert at the Hot House in Chicago and two concerts at the International Festival of Louisiana. In May 2005, Manou performed two concerts at the Ollin Kan World Music Festival in Mexico City, Mexico. On September 2, 2005, she gave a concert at the Arts Life Festival in Johannesburg, South Africa. In November 2005, Manou created and interpreted all the musical settings for the play “The Bogus Woman” written by the English author Kay Adshead and directed by the Scot Michael Batz. Comedienne Carole Karemera was the Manou Gallo’s partner onj stage. This work was a great hit during its month at the “Théâtre de Poche” in Brussels. In 2006 MANOU composed her second album “MANOU GALLO” in collaboration with Patrick Dorceau. Overcoming her shyness, transgressing her cultural barriers, her education, her roots, MANOU has been exploring inside herself the necessary resources to create this very personal opus. The European release of the CD is scheduled for the 1st semester of 2007. At the end of 2006 she created a new line-up for her new live performances in 2007. In March 2007 she was Manu Dibango’s guest at the Casino de Paris / France for the celebration of his 50th year in music. A 52’ documentary film “RHYTHM GAL” was broadcasted. This film recalls the incredible artistic life of Manou. In 2008, she creates her new semi-acoustic band : the « women band ». She goes on tour all around Europe and start to prepare the demos of her new CD « LOWLIN » (meaning travels) that she records between Abidjan, Bruxelles, Copenhaguen and Budapest during the summer 2009. « LOWLIN » is a real jewel of sensitivity, feminity and imagination ! A trip into the atypical musical world of this exceptional musician. At the end of 2009, Manou was on tour with the Women band in Haïti, in Guatemala, in Costa Rica and in Quebec. In march 2010 , she will be the special guest of the Dutch drummer Lucas Van Merwick which gathers an all stars band of Dutch musicians. Manou’s musical directory will be revisited and she will perform on stage with them for 11 concerts. « LOWLIN », her 3rd album, produced by Igloo mondo, released in Europe in March 2010. In october 2009 , Manou Gallo was nominated by the MAMA Awards 2009 (MTV Africa) as the “best performing artist of Ivory Coast 2009”.